Forrest and Sarah headed to Anna Maria Island to enjoy Forrest’s day off. They were just relaxing in the sun, swimming, and then decided to toss a ball around for a while. Forrest was standing in waist deep water and tried a one handed catch. The ball caught the bottom of his wedding ring and lifted it over his knuckle and as his hand flew back the ring spiraled into the gulf. He stood right where he was and people searched around him for several hours. It was not to be found. Forrest contacted SRARC and Mike Miller scheduled a team for the next morning. 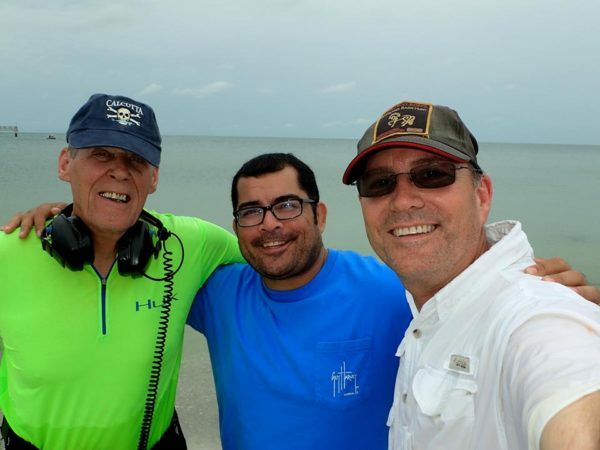 Mike and Ed Osmar worked for about a hour in neck deep water with no luck and then Mike Shuler arrived and went to work. About a half hour later Shuler yelled “Is it yellow gold?” and held a gold ring into the air. Forrest rushed over and proclaimed “ I can’t believe you found it” Lots of smiles and hugs followed. 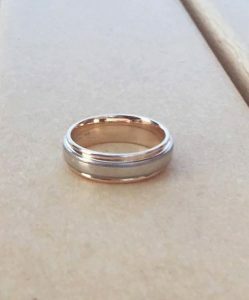 We are very happy that we were able to return another cherished wedding ring. Anna and her husband Ryan were down to Tampa from Tifton, Georgia for their daughters gymnastics meet. 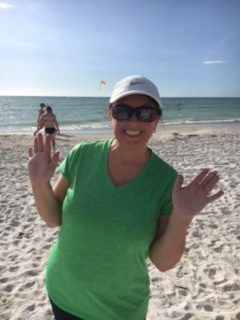 Since they had Saturday off they decided to head to St.Pete Beach for the day. 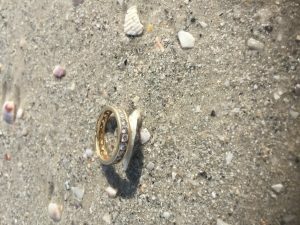 Anna was sitting on a beach towel watching her daughter play and had taken her 3 rings off and put them in her lap. 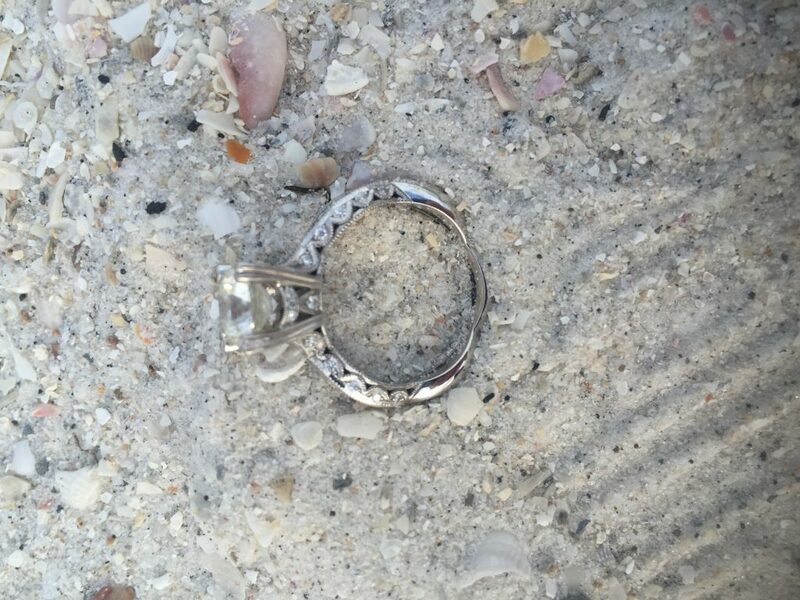 When she stood up to wave to her husband, away the rings flew into the deep sand. Ryan googled lost ring and found SRARC where he contacted team member Stan Flack. With Ryan waiting at the beach keep guard, Stan headed as quickly as he could. A quick description of what had happened and Stan went to work, finding all 3 rings in minutes and within inches of each other. A relieved Anna jumped for joy. Another sad drive back home avoided. 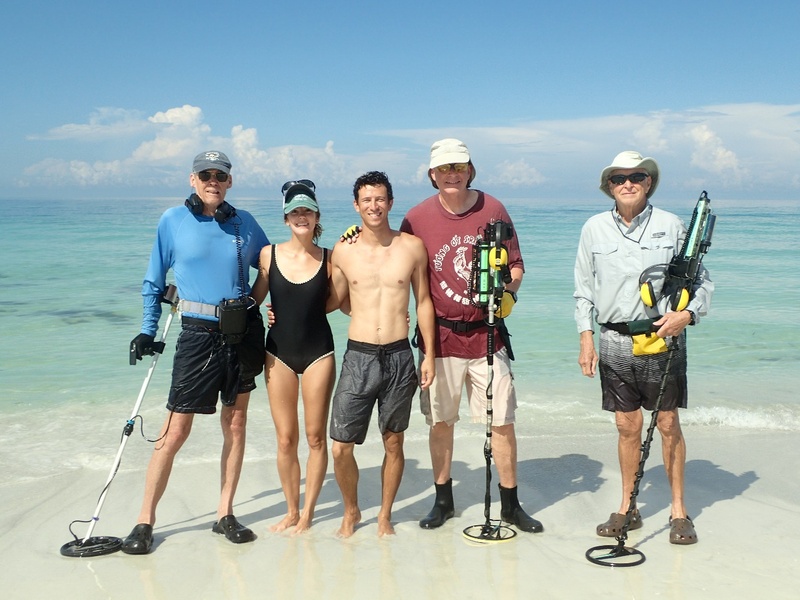 Charles and his family were over from Tampa enjoying a day at Ft. DeSoto Beach. 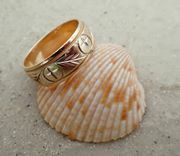 Once in the water, Charles decided to put his wedding ring in a zippered pocket for safe keeping. 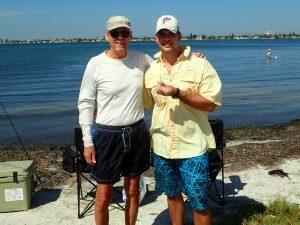 As soon as he got it off his finger, it slipped out from his hands into the waist deep water! 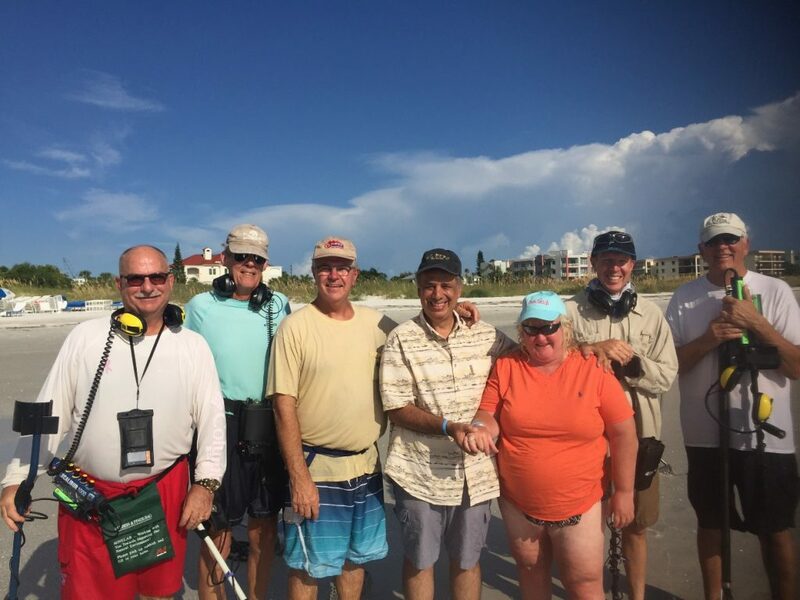 Charles’ wife searched the web for a metal detector and soon found and contacted SRARC. Wayne responded to the call and arranged for some team members to search the next day. Mike Miller & Paul Hill spoke to Charles to get details as to where to begin the search. Charles asked if a Google Earth photo would help? Absolutely! With this information, Mike & Paul set out to divide and conquer! Each man took an end of the area and worked their way to the other. Less than two passes later, Paul had the ring in his scoop! A call was made and Charles drove over to pick up his “precious” as he called it. Charles thanked the team profusely and as he was leaving he claimed “I’ve got my MOJO back!” We are happy for your Charles! Thanks Mike & Paul for being there for him. 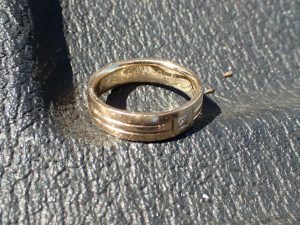 Stan and Linda Flack got a call from a friend whose son Kyle lost his wedding ring off their dock last Sunday. They had just attended his wedding in February so you can imagine how upset he was. One attempt was done but it was windy, cold and too deep. Second trip had a little less wind and lower tide, bingo. Return number 52 for Stan and it was a tough one. Had to take 2 cracks at this one which landed in what felt like chocolate pudding. In the end, it found its way into his scoop. Way to stay at it Stan…Dock hunts are extremely tough! 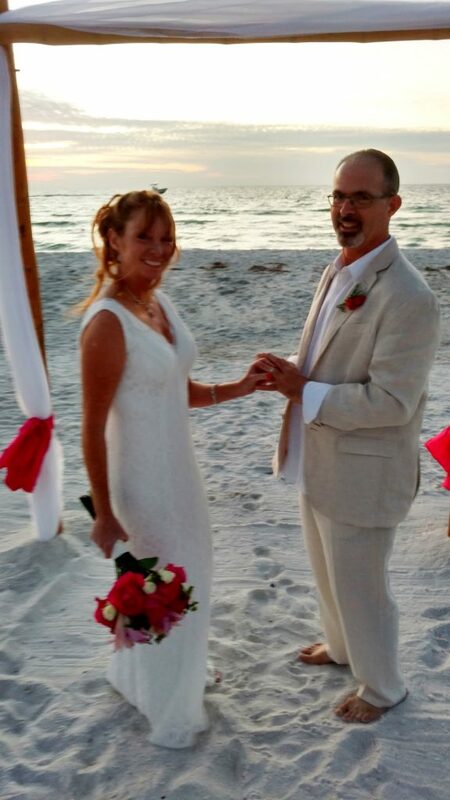 Scott and Tracy planned a beautiful wedding at sunset on Pass A Grille beach. Everything was setup and almost ready to go when Scott was walking across the boardwalk to the beach. As he was walking across the sand he felt strange and thought he heard something hit the sand. He stopped and checked everything he had been carrying and discovered he no longer had the wedding ring. Everyone rushed over to look but had no luck finding the ring. The wedding planner quickly informed them he knew of a group that could help. He contacted Stan Flack of SRARC Ring Finders who passed him on to Mike Miller. Mike said he could come right over but it was getting late and the sun would soon be down so they decided to go on with the ceremony without the ring. By the time Mike got there the ceremony was over but the bride and groom were still at the alter. Mike went right to work and within 5 minutes he found the ring. Everyone was relieved and the ring was rushed over to the couple and it was just in time for Tracy to slip the wedding ring onto Scotts finger. 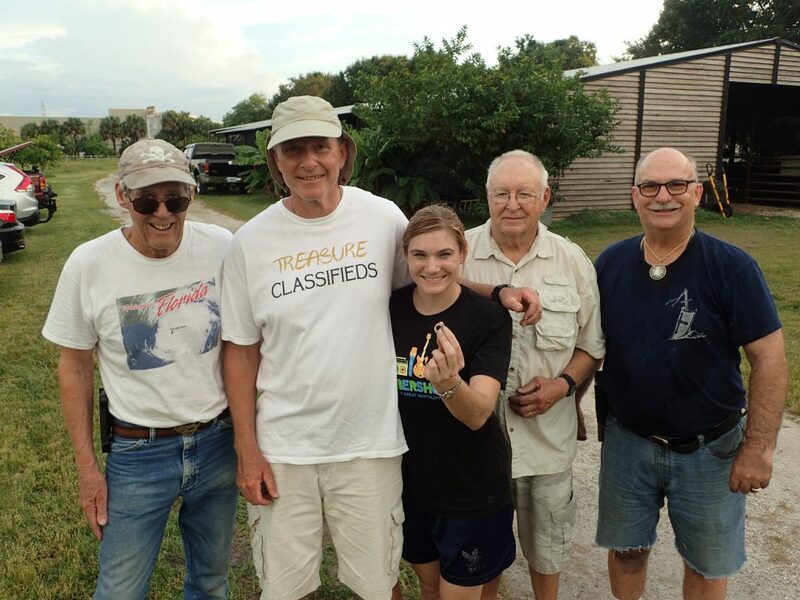 SRARC is so happy to have been able to recover and return this ring. We wish the happy couple all the best in their future. Mike, Rachel, and children were down from Indiana for fall break. After spending the morning swimming and relaxing in the sun, Mike noticed his children tossing a football on the Beach. He joined them and moved out into about chest deep water. They threw the ball for a few minutes and on the final toss Mike saw his wedding ring fly off and disappear into the waters of the gulf. The whole family looked for several hours but could not find it. 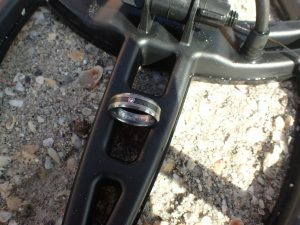 Mike googled for a place to rent a metal detector and found the SRARC Ring Finders Service. He contacted us and we set up a hunt for the next day. 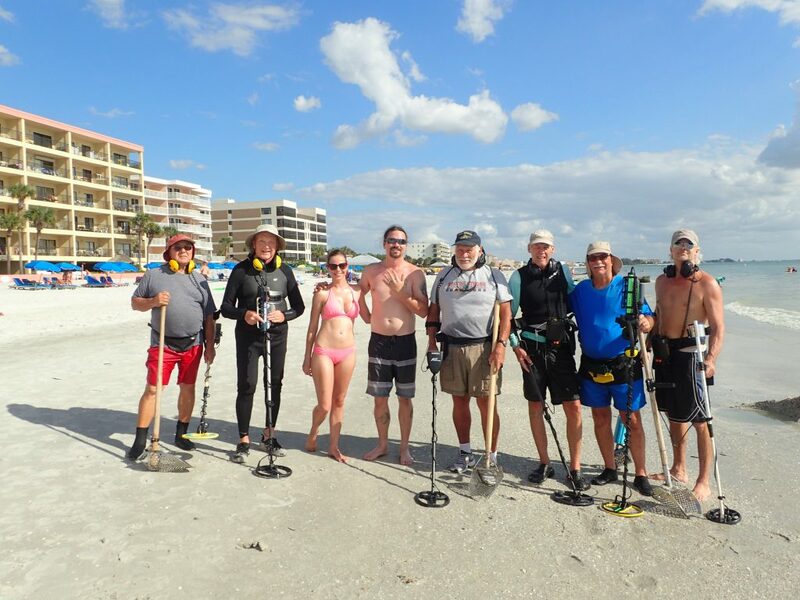 Jim Adams, Joe Montione, Mark Sillence, Bill Gallant, Jeffery Miller, and Mike Miller joined in the hunt and within 15 minutes Bill said I think I found it. Sure enough Mike rushed over and confirmed it was the missing ring. Rachel, Mike’s wife, also came rushing out in disbelief and gave Bill a great big hug. Mike told me later she had no faith that we would find the ring and had told him it was a 1 in 1 million chance. The SRARC ring finders team is happy to be the ones to make a I in 1 million opportunity come true for Mike and Rachel. 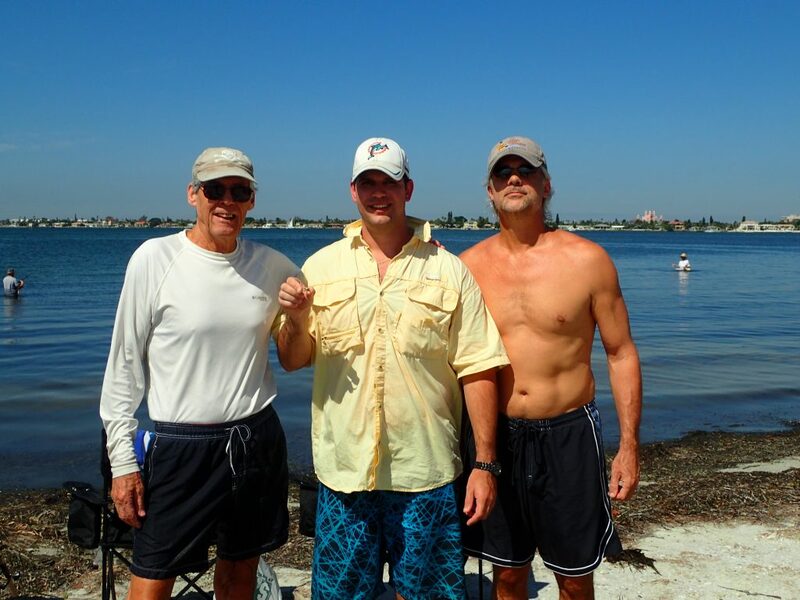 Nick came down from Ocala with his Dad, Brother, and Father-in-law to fish in honor of his recently lost Aunt whom had fished many times with his father in this very spot over the last thirty years. After fishing for a short time, Nick hooked a nice Red fish and while unhooking it got stabbed with a fin. As he jerked his hand away, off flew his wedding ring. He has only been married for 5 months and he could not imagine how he was going to explain not having a wedding ring to his new wife. They had been fishing in about waist deep water and had the foresight to mark the spot where the ring came off with a stick stuck into the grassy bottom. They all searched for about an hour before realizing that they were not going to find it. 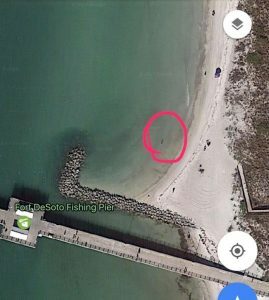 Nick got out of the water and did a search on his smart phone for lost wedding rings in St Petersburg. SRARC Ring Finders Recovery Service popped up right away and he called the numbers listed and Mike Miller soon responded. Mike put out a quick request to the team members and headed for Nick’s location. Mike and Jeffery Miller both arrived about the same time and began the search. It only took a few minutes for Mike to locate and recover the ring. It was within three feet of where the stick had been pushed into the bottom. Nick was extremely happy to get his ring back and relieved that he was not going to have to explain a lost wedding ring to his wife. SRARC wishes them both many happy years together. 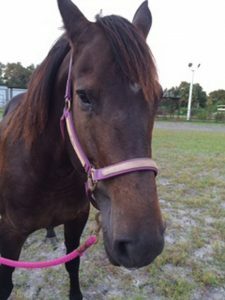 Melissa was out putting her beautiful horse Bella through some tough exercises on Tuesday evening and Bella got rebellious and started to buck and act up just a little bit bouncing Melissa around a little more than normal. Prior to riding, Melissa had carefully placed her wedding ring into a pocket for safe keeping. Parts of the ring had belonged to her great-great-great grandmother and had been used through 5 generations of family weddings. It has significant historic value to the entire family. After finishing her workout with Bella, Melissa washed her down, lead her back to the holding stall and put her away for the night. As she walked away from the stall she reached into her pocket to retrieve her wedding ring. It was not there. Panic immediately set in and Melissa raced around the barn, staging area, and arena frantically looking for her ring. She looked until it was to dark to see anymore then got a flashlight and searched for three more hours. When she finally gave up and returned home she got onto the internet and searched for help or maybe a place to rent a metal detector. She found SRARC Ring Finders, sent an email and then spent a sleepless night waiting to hear back. The next morning she called Mike Miller and they arranged to do a hunt that evening. Mike, Ed Osmar, Mike Shuler, and Mark Sillence all showed up as well as Melissa and her husband Bruce. 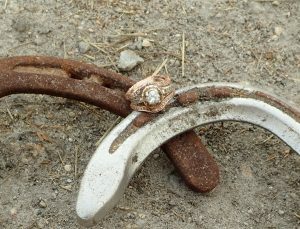 Melissa explained the events of the previous evening and suggested that the ring was most likely thrown out of her pocket when Bella started her bucking episode. Mike set out small flags across the arena to establish scanning lanes and we all went to work, Mellisa and Bruce scanning by eye and the rest of us scanning with metal detectors. An hour later Mike Shuler held the ring high over his head and shouted “I found it”. We all cheered and Melissa ran over and gave us a big hug. Sadly the ring had been stepped on by a horse and was damaged but it was still in one piece, had all the diamonds and can be repaired. Thanks Mike for your great recovery. 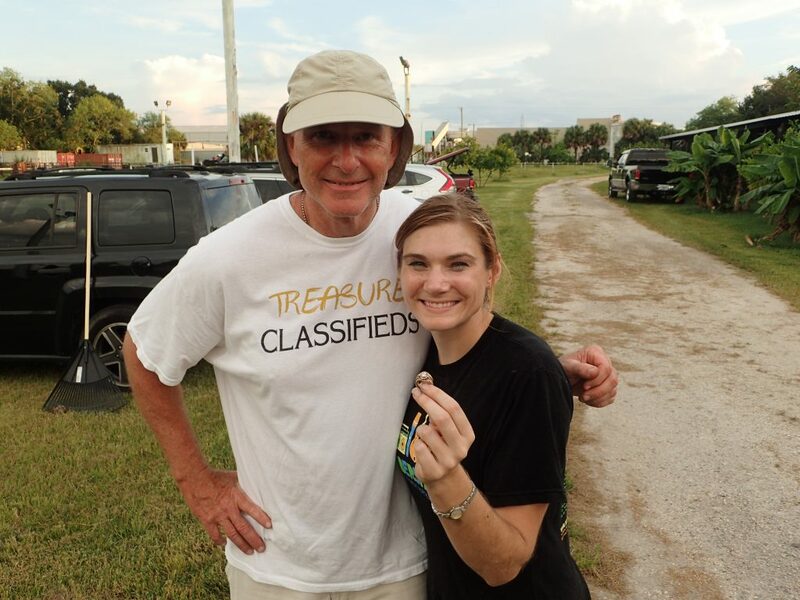 SRARC is overjoyed to have been able to help recover this heirloom for Melissa and Bruce whom we wish to thank for their service in the United States Air Force. We are also extremely happy to have been able to serve you. 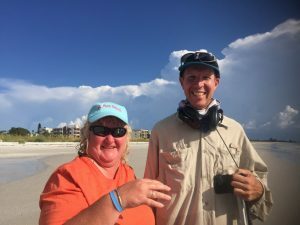 Tony and Tammy were visiting from Michigan and staying at the Don Cesar Resort in St Pete Beach. While out playing in the water, Tammy lost her ring. After looking as long as they could they retired to their room where she spent a sleepless night thinking that she would never see her beloved ring again. Tony assured her that the ring was insured and could be replaced. She didn’t want another one, she wanted hers back. This ring is very special, Tony had given it to her after the birth of their daughter. He came into the hospital room and told Tammy that she had given him something very special and he wanted to give her something special and presented her the ring. The next morning Tony contacted SRARC and talked to Tom Jones asking for help hopeful that someone could find the ring. A hunt was scheduled at 5:00 that afternoon. Tom, Joe Szemer, Mike Miller, Mark Sillence and Wayne Cree arrived and after meeting up with Tony started hunting. 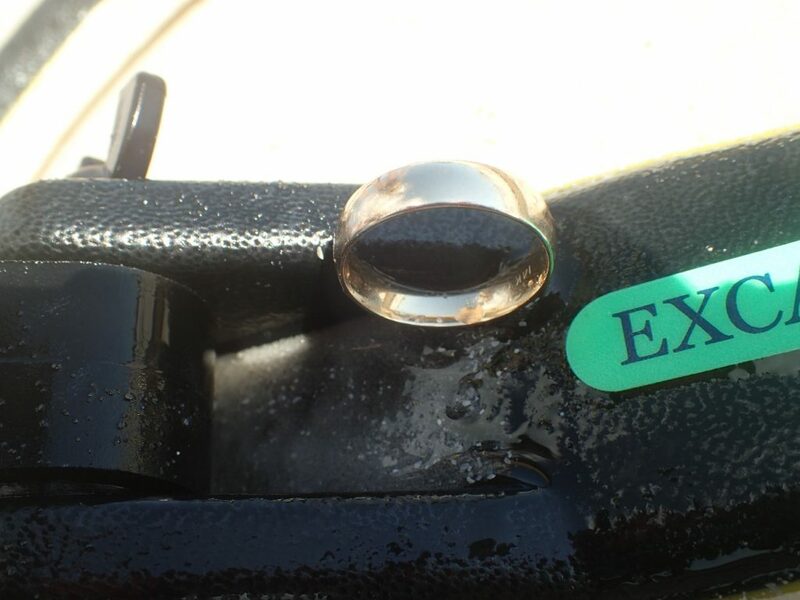 30 minutes into the hunt Joe Szemer, who had moved into shallower water and out of the hunt area waved Tom Jones over and asked, “is this the ring?” Tom said I think so and took the ring. Joe said to him as he walked off, “if that’s not it I want it back”. Tom made his way back to where Tammy was and found her with a dive mask and her head under the water. He walked over to where she was at and put his hand with her ring on his finger under the water in front of her mask. Tammy’s head came quickly out of the water and said, “Oh, my ring. You found it.” Tony came over and was so happy that he wanted to personally hug everyone that had helped look for the ring. 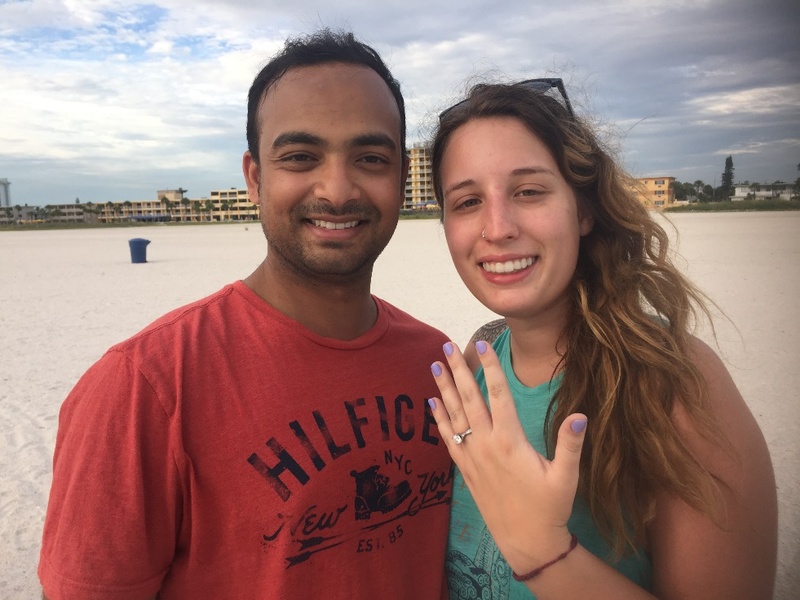 Emily and her fiancé Arnab have been engaged for 3 weeks and while at the beach Emily took her ring off and put it in the pocket of her shorts under a cabana while she went in the water. 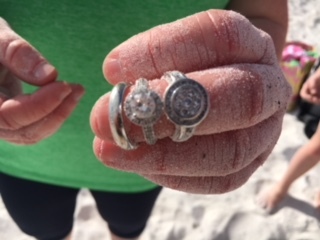 After putting on her shorts she realized that her ring was missing and they started searching through the sand and could not find her ring. Arnab told her not to be so upset, the ring was insured and could be replaced. Emily told him that she wanted the ring that he had put on her finger. She contacted Tom Jones to ask for help locating the ring. 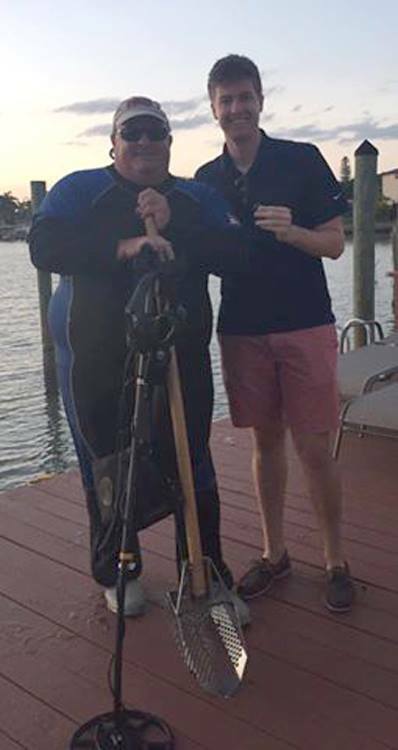 Tom headed immediately out to Treasure Island with his detector. Upon arriving he met Arnab at the cabana who told him that they had found the ring just a couple of minutes before he had showed up. While waiting for Tom, Arnab was kicking the sand and saw the ring fly out. The couple thanked Tom for being available to help and told him that they had learned a lot that day.